The crisp, tender sprouts of various germinated beans and seeds, Mung bean sprouts, used often in Chinese cooking, are the most popular, however, other seeds and beans — such as alfalfa and radish seeds, lentils, soybeans and wheat berries — may also be sprouted, and for optimum crispness, sprouts are best eaten raw, but they may also be stir-fried or sautéed, but should only be cooked for 30 seconds or less; longer cooking will wilt the sprouts. Bean sprouts are the tender plant starts that grow when exposed to moisture. Choosing: Bean Sprout is packed when bought on supermarkets. Even though raw sprouts takes months to rot, still check for expiration date that can be found outside the packaging. Also do not buy Bean Sprout with damaged or broken container. 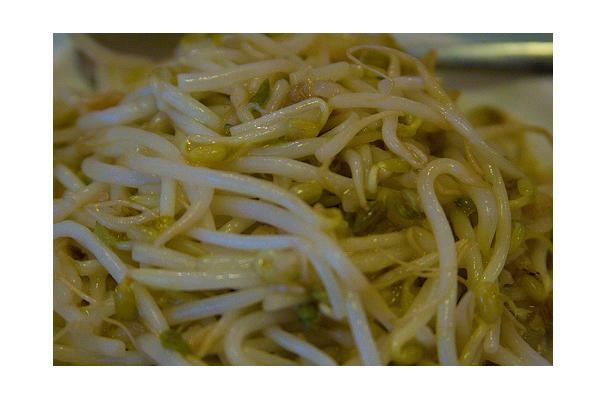 Buying: Bean sprouts can be bought on your local supermarket or market place. Procuring: Though bean sprouts are typically found in Asian dishes, their nutritional value is often taken for granted. Perhaps it is because bean sprouts are not as filling; that is why many people tend to think that bean sprouts contain nothing but air. However, bean sprouts are small but terrible. These are very nutritious and contain vitamins A, B and C as well as Calcium, Iron and Potassium. These nutrient packed bean sprouts are easy to cook. Corollary to this, bean sprouts are also easy and economical to grow. in clean cold water for an hour (Some people soak the beans over night for fast result.) Make sure that the container you use for soaking is clean. After soaking the beans, rinse these well. You will notice that the beans are bit slimy. Do not despair, this means that your beans are starting to sprout. Strain and rinse your beans well then pour onto a paper towel to cover the wet beans. Lastly, shower the beans with cold water and put in a container away from direct light or heat. * Now you will be able to enjoy delicious bean sprouts grown right at your own kitchen. In chinese cuisine mung bean sprouts are stir fried as a vegetable accompaniment to a meal. To make it stir fry minced garlic, ginger in a little bit of vegetable oil and add a little bit of salted dried fish to add flavor if you like until it golden brown and add bean sprouts stir fry it for another minute. It should be still a little crunchy. Uncooked bean sprouts are used in filling for Vietnamese spring rolls. You can use bean sprout in the soup as well. Add a little bit of it in the hot soup, right before it served. To use bean sprouts in stir fry noodle, just add those few minutes before it done. Bean sprouts add the crunchiness in stir fry noodle. In Korean dish slightly cooked mung bean sprouts are often served as a side dish. To make this placed them into boiling water for less than a minute, then mixed with sesame oil, sesame seed, grounded garlic and salt. You can add a liitle bit of thin slices red pepper as well for color and garnish. When growing bean sprout seeds at home, you'll want to create a sterile growing environment to reduce bacteria and pathogens. According to the University of California at Davis Division of Agriculture and Natural Resources, raw sprouts are a significant source of foodbourne illness, with the source being a seed contaminated with pathogens. Bathe the seed in a warm bleach solution and you'll decrease the risk exponentially. Heat a quart of 3 percent bleach (found in drug stores) to 140 degrees. Pour the bleach in the pot to heat. Check with a digital cooking thermometer to ensure it is 140 degrees. Place bean seeds in a small mesh cooking strainer and submerge in the solution. Swish the strainer back and forth every minute to evenly coat the bean seeds. Maintain the temperature at 140 degrees and continue swirling the mesh container for five minutes before removing from the heat. Rinse the bean seeds under cold tap water for one minute. Submerge the seeds, still within the mesh strainer, in tap water plus 1 inch, until any seed coatings, seeds and debris float to the top. Skim off the debris using a sterile slotted spoon. Sprout the seed in sanitized containers. Wear cleaning gloves when working with bleach. Remove the bean sprouts from the packaging bag. Place the bean sprouts in a bowl. The bowl needs to be large enough to take both the sprouts and water that will cover them. Fill the bowl with water. Pour enough to cover the sprouts with water. Add a few slices of lemon. The water and the lemon will keep the bean sprouts fresh for longer. We have a story about the bean sprout. It says that in Nanbokucho era the military commander, MASASHIGE KUSUNOKI, gave the sprouts of the bean to his soldiers when they were besieged in CHIHAYA and AKASAKA castle, and they put up with the close enclosure of the enemy line. Recently when Suez crisis occurred, British forces in Arabia asked for help to the nutritionist of the homeland as they were at a complete loss with the lack of the vegetable. After the research, they sent soy beans to produce " bean sprout " for eating. History: The bean sprout is said to have originated in the success of sprouting vegetable seeds after mankind found for the first time that they grew out. Regarding the way of the germination, the widely accepted theory is that it was propagated generally after it was introduced from the Middle East region ( Balkan and Southwestern Asia ) and Eastern Mediterranean to the Chinese region via Eastern Iraq region and Turkestan region. The mankind found storable food, provided it all the time, and preserved its seed. So the way of the cultivation from the seed also made great contributions to the development of the communal life. In Japan the bean sprout was introduced as「毛也之」( Moyashi ) in「本草和名」( Honsowamyo ), the oldest book about medical plants written in Heian era. It seemed to be grown as a medicine. 『和漢三才図会』( Wakansansaizue ) written in Edo era says that the palsy, painful affection of the knee, and muscular cramp are healed when you produce bean sprouts from black matpes, evaporate their 15cm-long sprouts, parch them well, then take. Originally the bean sprout was mainly used as a medicine. It has come to be delivered to the Chinese restaurants with the appearance of the specialized producers in big cities since the end of Meiji era. Gradually the flavor of the bean sprout has become familiar as common taste.